The smell of smoke in a Woodstock residence at 5102 S.E. 42nd Avenue at Mitchell Street alerted residents that something was wrong – on January 10, at about 6:30 a.m.
Fire Engine 9 from the Hawthorne District arrived first, quickly followed by both the Engine and Truck companies of Woodstock's Station 25. "The incident caused a lot of smoke, but no visible fire," later said PF&R Public Information Officer Lt. Rich Chatman. 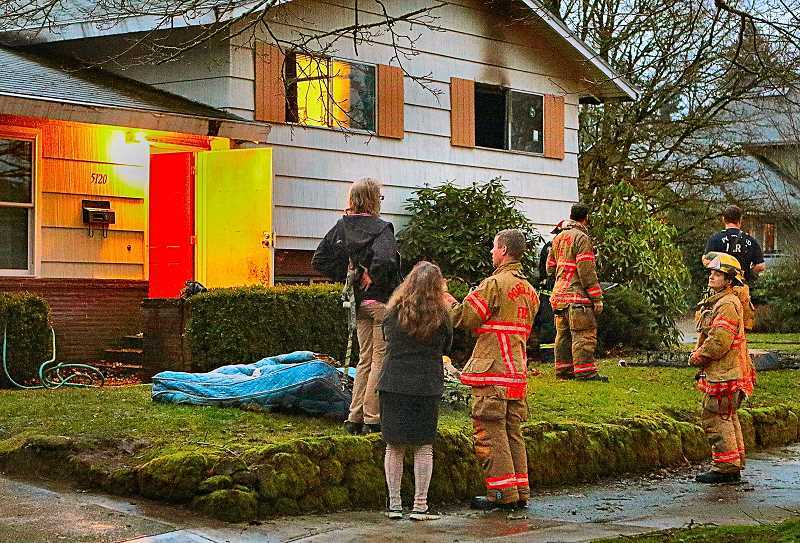 "In this case, the residents did 'everything right'; someone called 9-1-1, while another tried to put out the fire in the box-spring mattress in an upper bedroom with an extinguisher. "When that effort failed, they closed the door to the bedroom, and left the residence," Chatman went on. "Closing the door to a 'fire room' keeps fresh air from feeding the smoldering fire. When firefighters arrived, they were able to quench the embers, before hauling the mattress out of the home. "So, remember to have working fire alarms – and if there is a fire, close off the room as you call for help, and promptly leave the building," Chatman summarized. The fire remains under investigation. The American Red Cross, Cascades Region, responded to help the four displaced adults and pets, by providing them with immediate basic needs.